Chelle-Chelle.com – Crochet, Knit, Craft » Knitting Cables! I’ve been knitting for a few years. I first learned how to when I was relatively young, but never picked it up again until I was around 16-17. And honestly, I don’t do a lot of knitting. I can knit, I can purl. I can sort of do increases and decreases. I cannot follow patterns at all without wanting to scratch my eyes out with stitch holders. Oh, I also can’t knit in the round, so everything is always (always!) knit flat. In other words, I can do garter stitch, stockinette stitch and ribbing. And… that’s about it. But lately I’ve been knitting a lot (doll-sized sweaters for my Blythe dolls) and on a whim today at school, I decided to cast on another doll-sized sweater and I felt the need to attend doing cables. I only had two needles with me and yarn. I went through my pencil case (twice) but there was nothing that was thin enough to act as a cable needle (I was knitting on 3mm needles). And then I posted my pad of Post-It notes at the bottom of my purse. I peeled off the top sticky note and then folded the sticky part onto itself a few times and used my scissors to cut off the excess and I used that as a cable needle. One of my friends (who sees me knitting all the time…) wanted to know why I was knitting with paper. Needless to say, my makeshift cable needle worked! But… to prevent the need to use up paper again, I’ve tucked a few large safety pins into my bag so I have impromptu cable needles for the future (and stitch holders). 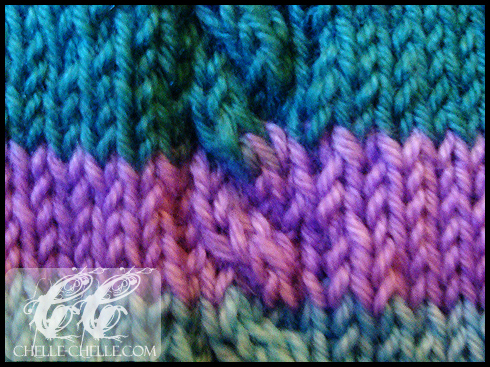 When I knit cables I try to put at least two columns of purl stitches on either side of the cable (gives it definition)…and I also don’t use cable needles. I just hold the cable-stitches with my fingers as I knit around them. It’s a lot easier than fumbling with cable needles, in my experience.